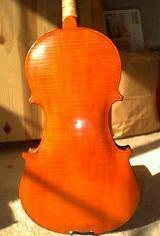 Also available, Tomassi Violins and Violas, hand made by Frank Thomas. These instruments are played in the San Francisco Opera, the Schubert Theater, and the Utah Symphony Orchestra. They are based on Guarneri's work and use only high grade, air dried woods. A strong, professional instrument, suited for the orchestra, chamber, or solo work. Violas are offered in two sizes, full (16+") and pettit (14.25"). Frank has recently been using some very fine figured Canadian maple, many one piece backs. Purfling can be ornamented with discrete chip inlay at the c-bouts. Frank's many years of experience as a voice teacher, speech coach and professional singer has given him the unique ability to craft an instrument with all the sonorities of the human voice. The violin pictured here is "Strad Amber." Cremonese brown is also available. Note the high quality maple (this one a single piece) back and rosewood appointments. Those wanting dramatic grain may choose a slab back. Hear what the players say! "I have enjoyed their warm and responsive tone and have used them many times with the San Francisco Opera Orchestra." -Bill Pynchon, Assistant Principal 1974-1998, San Francisco Opera Orchestra, owner of two Tomassis. Frank hand carves all instruments, carefully graduating them for maximum tone, projection, and power. Plates are carefully tuned to emphasize proper harmonic structure.